POES (Polar Operational Environmental Satellite) are a NOAA (National Oceanic and Atmospheric Administration) satellites in polar orbits that collect global data on a daily basis for a variety of land, ocean, and atmospheric applications. Two satellites, a morning and afternoon satellite, make up the POES constellation and provide global coverage four times daily. Each carries seven scientific instruments and two for Search and Rescue. 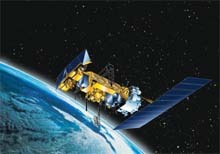 Their measurements are used for weather analysis and forecasting, climate research and prediction, global sea surface temperature measurements, atmospheric soundings of temperature and humidity, ocean dynamics research, volcanic eruption monitoring, forest fire detection, global vegetation analysis, and many other applications. POES and the Department of Defense's DMSP (Defense Meteorological Satellite Program) are currently being merged to form the NPOESS program which will be managed by an Integrated Program Office headed by NOAA.